Not much info Be prepared. Have enough water and a means to make more. One of the most dangerous things about dehydration is that people don't realize they're getting dehydrated. You should always drink more than you think you need, and make sure you're eating salt and taking electrolytes. On my first backpacking trip I wasn't drinking nearly enough water and by the time I got off trail I probably should have been hospitalized. Scary but glad they had a safety net! Those Gatorade chews are legit awesome on the trail. They make a great sweet treat loaded with electrolytes on the ridge. I put a package of them in my fanny pack and we each would eat some on the hot ridges. Also we added “ mio sport” this year instead of Gatorade powder and it worked great. Adding to that, make sure you have the water capacity to carry all the water you need on the ridge. Keep drinking at each break or when you stop to check the view or for the next cairn. Interesting video. I enjoyed Air Station Traverse City's take on their posting. I stepped through the video and plotted the few GPS locations available. They are plotted in the screen capture below, in chronological order as they appear in the video. No way to know for sure where the exact pickup location was due to editing of the video, but the general area is clear. Midwest Ed, nice job plotting poistions. 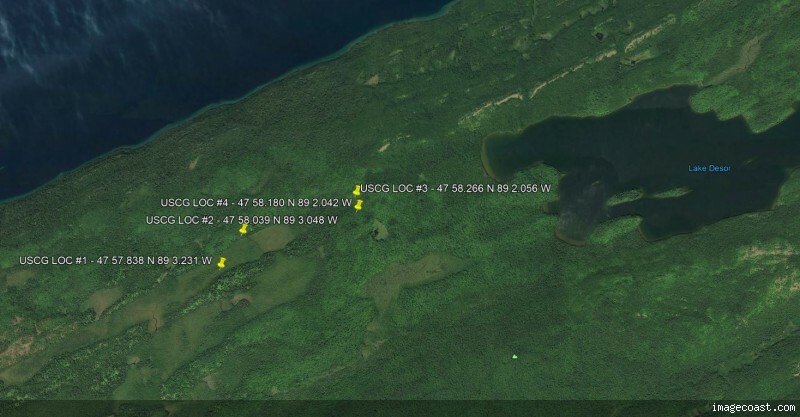 I am guessing based on the map plots that the 3 were on the Minong between NLD and Washington Creek. Tough stretch of trail, but you do have to go over 2 Beaver dams and there is (or was) water, albeit highly silted and difficult to filter, feet from the trail in several places. Are the impoundments behind the dams still there? Wow, great video to see them in action. Glad everyone was safe, thanks to their effort. Does this helicopter have to hit a refueler after the trip out to the island, loiter time, and then the flight to Duluth? A good point. Throwing a package of those in our packs. A simple addition can prevent a challenge from becoming a tragedy. Traverse City Air Station recently switched from the "Dolphin" (M-65) helicopters to the "Jayhawk" (Sikorsky MH-60T). It has a rated range of 700 nautical miles. Operationally, the CG specs are a range of 300 NM (out and back) with about 45 minutes loitering time. Traverse City is less than 250 NM from anywhere on the Island and their delivery point of Duluth was only 170 NM from their recovery point, so I doubt they had to stop anywhere. (but then again, who knows where they were when they got the call?) If they did refuel it probably would have been Station Portage in Dollar Bay, MI or Station Marquette on their way out or almost certainly in Duluth before heading home. It is a Facebook link. I noticed it does not work from my phone but is OK on my computer. Try copying and pasting the link into your browser (right click on the video). Or maybe this will work for you.